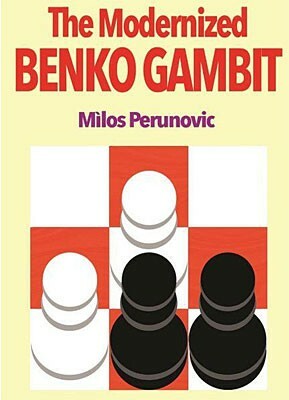 Produktinformationen "Perunovic, The Modernized Benko"
Milos Perunovic is a renowned Benko player and he scored many great wins using this gambit in his long professional chess career. In his younger days, he collaborated with the Russian choaches Alexander Nikitin and Orestes Averkin. He participated in 4 Chess Olympiads and 6 European Championships and was the Serbian national champion in 2005 and 2007. We also remember amongst his greatest performances beeing the winner of the "Veselin Boskovic" tournamnet 2006 and the Berlin Open 2014. He also took second place in the Chicago Open 2012, participated in the World Cup, Baku 2015 and shared first place in the Grenke Open 2016. The Benko gambit is the ideal way to fight and seize the initiative as Black. Grandmaster Perunovic, revisited all the modern lines and provided unbiased coverage of the more recent ideas, the most important being the delay of the recapture on a6. He found and tested in practical play, many new but still typical Benko manoeuvres. If you wanna surprise the 1.d4 player, this book and opening will be your perfect guide! Weiterführende Links zu "Perunovic, The Modernized Benko"
Kundenbewertungen für "Perunovic, The Modernized Benko"